We run lovely baby classes across lots of venues in Edinburgh & the Lothians. 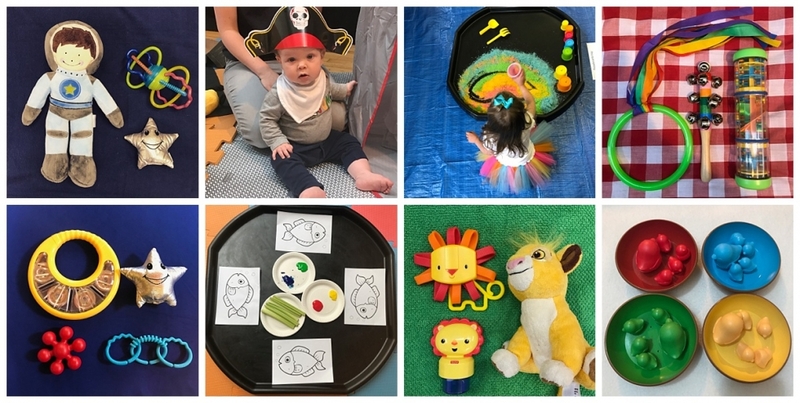 Our classes have been designed by an occupational therapist trained in sensory development with babies to be baby led, colourful, themed and they are full of exploratory play and led play. Each class you come to is different, we’ll talk you through how your baby’s eight senses development and give you lots of information about using our toys. We know that sensory activities help aid development and you’ll love interacting with your baby as you share new and exciting experiences. Our sensory play classes have been developed to stimulate your baby or toddler’s sense of touch, smell, sight, hearing, balance and proprioception while encouraging creativity and exploration in a safe environment. Most of all though the classes are fun and interactive, helping you learn to interact positively with your little one. The classes run weekly, you can start at any time in the term subject to space being available. You’ll come away with lots of ideas to continue supporting your child’s development at home. Our classes are split into two stages, the first is for our littlest babies up until they are sitting. The second stage is for when they are sitting until they are on the move, once they are confident crawlers we can move them into our play session classes. We can move your little one between classes during a term, subject to space, and they are welcome to come to classes in the term after their 1st birthday after which you can come to our toddler sessions. We make sure that our classes are suitable for all of our babies attending them.